Lord Ruthven a écrit : L'article du dernier Mad te rejoins assez. donc ça fait des années qu'on nous parle d'une oeuvre de génie totalement défigurée et en fait non, comme on pouvait s'en douter, elle était juste déjà moisie à la base. Commissaire Tanzi a écrit : Changer la merde en or, c'est plus du montage mais de l'alchimie! Pourquoi ? Ils refusent de vendre les droits à des sociétés françaises à cause de la non participation de la France à la guerre en Irak ? The restoration that horror fans everywhere have been waiting for is arriving just in time for Halloween: Shout! 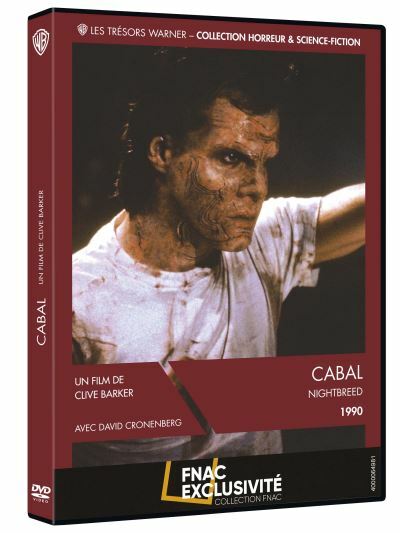 Factory has revealed a street date and other info for its Scream Factory release of Clive Barker’s Director’s Cut of NIGHTBREED, which will have two different editions. The two-disc Special Edition will contain the Unrated Director’s Cut on both Blu-ray and DVD, with bonus features to be announced. The Limited Edition will retail for $79.97, and the Special Edition for $29.93; those who order the Limited Edition directly from Shout! Factory’s website will receive an exclusive 18 x 24-inch poster of the new artwork while supplies last. The Director’s Cut will contain restored film footage, as opposed to the video scenes on view in THE CABAL CUT. Says Barker, in an official statement, “This is film history and beyond my wildest dreams of realization. When Scream Factory told me that they found the NIGHTBREED film footage I was gob-smacked! This is the ultimate validation of choices made by myself and Mark Miller [of Seraphim Films] all the way back in 2008. As we embarked down the road of attempting to track down the lost footage, we looked at each other and said, ‘Maybe one day they’ll find it.’ It’s my pleasure to announce that the day has come. “Speaking personally, I didn’t allow myself to believe that it would. Even if we did find some footage (which we did in 2009 in the form of heavily degraded VHS tapes) and even if we did find a company willing to release the film (which we did in 2013 with Scream Factory, God bless them) the prospect of finding the actual lost film materials was remoter than I’d wanted to admit out loud. If the footage could not be found by those who had worked closest on it the same year it had been released, then what were the odds we’d be able to find anything 20 years on? But Scream Factory, in their commendable determination, kept up the search and thanks to them total reconstruction has been made a possibility.